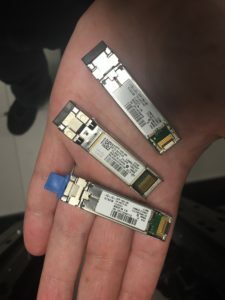 Probably not news to anyone, but there are counterfeit Cisco SFPs in the market place. It only matters for support purposes – all the SFPs are made to a standard, and it’s just a matter of what the label says past that point. As they say, if it quacks like a duck.. So how can you tell real from fake? Short answer – you can’t easily. If you buy through legit channels, you’re good. If you buy from eBay, there’s a pretty good chance they’re fake. If it’s from AliExpress.. well, I wouldn’t expect real ones. 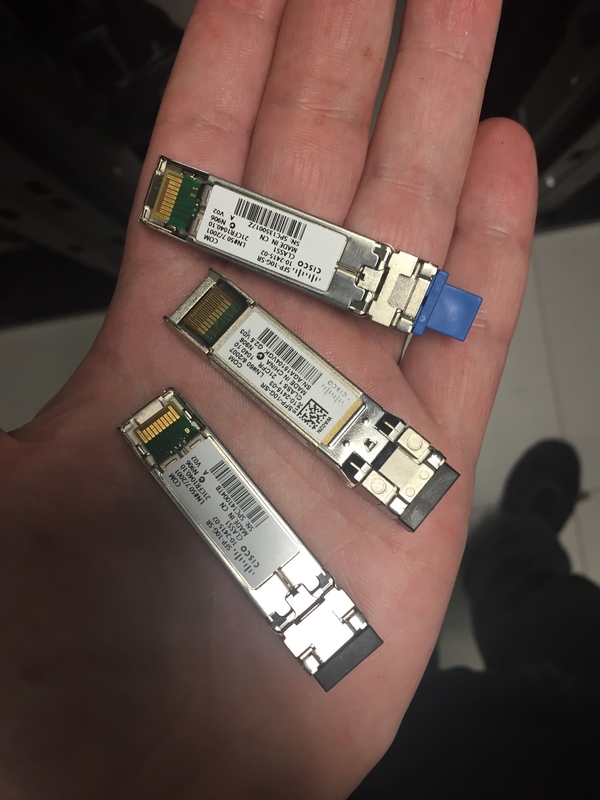 Going through some old photos, I found this picture from last year from an install job I did – all of these SFPs came directly from Cisco, and they all look different. If you have a venerable old FAS2240 or FAS255x, you can turn it into a disk shelf, by swapping the controllers with embedded IOM6 (IOM6E) for regular IOM3 or IOM6 controllers, and adding it as a shelf to a different controller. The opposite however is not always true. It is not supported to turn a disk shelf into a FAS2240, but there are instances where it might be required or desirable, and I’ve seen people hit it a couple of times. The FAS2240 PCM / IOM6E will work in any DS2246. However, while the DS4246 and DS4243 share an enclosure (the DS424), there are two revisions, and the FAS22xx/25xx only work in the newer one of them, which has better cross-midplane ventilation. Placing them in the older version results in a “FASXXX is not a supported platform” message and failure to boot. The original version, X558A (430-00048) doesn’t support the embedded PCM/IOM6Es, while the X5560 (430-00061) does. If the shelf was shipped new after April 2012, it is probably the X5560. Some earlier may be also. ONTAP 9.2 and the newest generation of platforms don’t support the out of band ACP connections on the DS4243/DS4246. With the newer ACP firmwares, the DS4246/IOM6 can do in-band ACP, but that isn’t an option for the DS4243. Despite what the product brief and other documents say, the DS4243 can be upgraded to a DS4246 with an IOM6 swap, and even more interestingly, they can both be converted into a DS424C with new IOM12/IOMC modules. This is officially a disruptive operation, but I’ve seen some people claim they have done it live without problems. YMMV. You might want to move to IOM12 as the SAS stack runs at the lowest speed, and the new platforms (FAS8200/2600/9000/700s) use the new SFF-8644 SAS connection, instead of the QSFP connections used previously. NetApp makes transition cables between the two, but I can assure you that you never have enough in the right lengths.